It's turning out to be quite a week for the science of genetics. First the DNA of the woolly mammoth has been mostly reconstructed. And now comes word that the final resting place of Nicolas Copernicus has been positively identified. Copernicus was the sixteenth-century astronomer who turned human understanding of the heavens upside-down (and would later on invite the wrath of religious officials especially after it was championed by Galileo Galilei) with his treatise "On the Revolutions of the Heavenly Bodies". Copernicus contended that in spite of the unquestioned assumptions of Ptolemy fourteen hundred years earlier, the Earth was not at the center of the universe! That in fact the Earth and all the other planets revolved around the sun, which was just another star among countless others. The heliocentric theory was of course correct and for this, Copernicus is widely regarded as the father of modern astronomy. 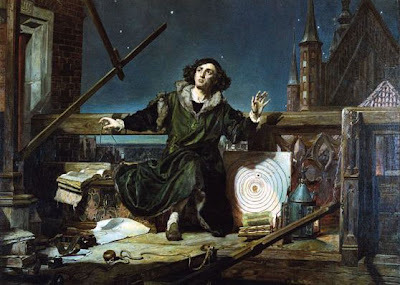 The one snag in Copernicus's theory was that he believed that the planets went around the sun in perfect circles (the idea of elliptical orbits was still waiting for Kepler, Newton and Halley to discover). Anyhoo, Copernicus passed away in 1543 and for two centuries there has been a search for his burial place. In 2005 remains were discovered at Frombork Cathedral in north Poland. Working from two strands of hair found in a book owned by Copernicus and a tooth from the grave, geneticists and archaeologists today announced that there was a perfect match. Incidentally, church officials are already happily mentioning doing something that "...will be able to pay homage to Copernicus with a tomb worthy of this illustrious historic personality," according to Jacek Jezierski, the Bishop of Frombork.